A reddish 'blood moon' will appear on Sunday night from North America and on early Monday from Western Europe. A total lunar eclipse one of the most dramatic and yet easiest to photograph celestial events of all. This coming total lunar eclipse on 20/21 January is visible to Western Europe, North America, and South America simultaneously. From a photography point of view, it's all about capturing a red full moon. It's a special sight, and though the night skies in January could well turn out to be cloudy, it is worth preparing to go out on a long night shoot. From the UK, the eclipsed moon will be visible in the dead of night, but the red moon will be sinking towards the western horizon, so could be captured with a foreground. That’s a rare chance. “There will be some really good opportunities for anybody in the UK who wants to take a photograph with a really interesting foreground because there will be a period during the eclipse when the moon is beginning to set, but it's still a very deep orange,” says Tom Kerrs, an astronomer from the Royal Observatory Greenwich in London and author of moongazing: Beginner’s guide to exploring the moon. For once, photographers in the UK are in pole position for this eclipse. Where and when is the Super Blood moon Eclipse visible from? For the UK, the short answer is anywhere. A south or west-facing back garden is fine if you just want to zoom in on a red moon, though venturing out to find an interesting foreground, and for better sightlines (it will be in the south-western sky) is advised. 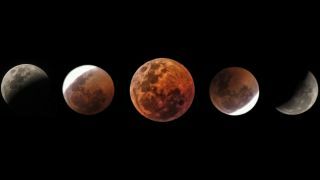 Totality – the period of the eclipse when the moon will be completely red – will occur for 62 minutes starting at 04:41 a.m. on Monday, 21 January. However, the event is longer and more nuanced than that, and it is worth making a plan to photograph at least the middle three hours of the five-hour event. "It’s a good idea to pick out two possible locations that you can monitor for weather and cloud cover," advises photographer and Sigma lens ambassador Jack Fusco. Fusco will use augmented reality apps like Photo Pills and Sky Guide to help determine the location of where the moon will be in the night sky. "While using one of the sky viewing apps, you can hold your phone up to the sky and change the time to see the exact location the eclipse will occur." From the UK the moon moves in a wide arc, so it could easily disappear behind a building as the eclipse unfolds; it's best to know exactly what you will see from any given positions. 03:33 a.m. – partial eclipse #1 begins: the moon begins to enter Earth's central shadow, and gradually gets redder because the only sunlight its surface is receiving is first coming through the Earth's atmosphere (the science is akin to what happens during a sunset). This is a really good time to take a photo of the moon because it will be partly lit, and partly red, though the slight curved line between the two – the Earth's shadow – looks odd indeed, so worth photographing in close-up. 04:41 a.m. – totality begins: a completely red moon. If you only want to quickly photograph a red moon, get outside at this time. Although the moon is red for just over an hour, the colours you can see can change dramatically during totality. 05:12 a.m. – totality peaks: the moon at its reddest just 24° above the western horizon. Now the whole process goes into reverse. PRO TIP: 05:42 a.m. is when a red moon will be lowest in the western sky, around 19°. That's when to photograph it with a foreground if you have a choice (clouds will likely dictate that). 05:43 a.m.– totality ends and partial eclipse #2 begins: the moon begins to move out of Earth's central shadow, and gradually loses its redness. PRO-TIP – 06:15 a.m. is when an odd-looking half-lit, half-red moon will hang about 10° above the western horizon. Another great (and very rare) opportunity to get a unique photo of it with a foreground. 06:50 a.m. – partial eclipse #2 ends, penumbral eclipse #2 begins: the moon is now completely within Earth's outer shadow, so looks grey again, though lacks the brightness of a typical full moon. For most photographers, it's bed-time. PRO-TIP – with the interesting part of the eclipse over, swivel your tripod 180° to see Venus and Jupiter in a rare side-by-side configuration in the eastern pre-dawn night sky. 07:48 a.m. – penumbral eclipse #2 ends: the full moon returns to normal. The exact times for North America are easy to find, but for convenience below are the times of lunar totality (only) for each timezone. Eastern Standard Time (EST): 23:41 p.m.-00:43 a.m.
Central Standard Time (CST): 22:41-23:43 p.m.
Mountain Standard Time (MST): 21:41-22:43 p.m.
Pacific Standard Time (PST): 20:41-21:43 p.m. Always use a tripod and a shutter release cable, and also shoot in RAW so you can drag-out shadow detail later during post-processing. "Your camera body, focal length, cloud cover, amount of light pollution and most importantly, the stage of the total lunar eclipse will all impact the camera settings you’re using," says Fusco, who advises a 600mm or greater focal length for close-ups. "Throughout the different phases of the eclipse, you’ll need to be watching the histogram and reviewing your images to make sure your exposures are looking good." With a telephoto lens, start with aperture f/4, ISO 100 and exposure 1/500 on the full moon, and tweak from there. "As the moon starts to pass into the Earth’s shadow, you can start increasing your ISO and your exposure time," says Fusco. "You won’t want your exposure time to go past a few seconds while using a telephoto lens as the moon will start to blur." When you start noticing the moon is no longer sharp, increase your ISO to let more light in. "Consider the dynamic range of your camera because when the moon is moving into the shadow, there's a dramatic difference in the bright and dark side of the moon," says Kerrs about the partial eclipse phase. "Some of the moon is going to be very dark, but if you overexpose it you'll completely blow out the highlights, so you could experiment with taking multiple exposures, bracketing and HDR – you can't really have too much dynamic range during an eclipse because the moon's change in brightness really is drastic." For UK and Europe-based photographers, this eclipse presents a great chance to shoot the red moon using a telephoto lens, then switch to a 24mm (or thereabouts) wide-angle in the latter stages of the 62-minute totality after 05:12 a.m.
"By that time the moon will be 23° degrees above the western horizon, so it will comfortably fit into a wide-angle lens with buildings or trees in the foreground," says Kerrs. That's a unique opportunity. "You may not capture much detail, but the moon during totality will be a very pronounced orange color in the sky, maybe even a red color depending on the balance of your camera," says Kerrs, who recommends taking a series of wide-angle photographs without moving the camera or tripod, and stacking them to produce an image that show how the moon's position and colour change. When the moon is fully eclipsed, try an exposure time of over a second long. However you decide to compose photographs this total lunar eclipse – the last visible from the UK until 2021 – be sure to take a breather. "With all of the planning and effort that goes into getting a great shot, it’s important that you take the time to appreciate the beauty in front of you," says Fusco. "Take a second to look up and take it all in!"